Microsoft Surface is a computer that interacts with the user through the surface of an object instead of the usual monitor and keyboard. As part of the Microsoft multinational corporation, Surface is one of a large product line of development, manufacturing, licensing and support of software, PC electronics and operational systems. Microsoft revenues were report as USD85 billion in 2016 and employees numbered 114,000. 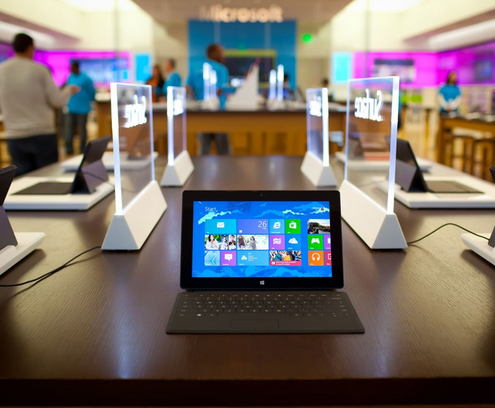 Phone technical support for any Microsoft Surface is 1-800-642-7676. You may also find support at the above website or through social media below. To contact Founders Bill Gates or Paul Allen as well as CEO Satya Nadella or President Brad Smith you may address correspondence to them at One Microsoft Way, Redmond, Washington USA 98052-6399. The corporate office phone number is 425-882-8080. Besides the whiteboard interactive Microsoft Surface, Microsoft’s successful product line includes Windows OS, Skype, Azure and Xbox. Social presence and support may be found on Facebook, Twitter and Instagram. My Surface had 3 bright/dead "spots" on the screen since the day I purchased it. Decided to contact Microsoft to get it replaced. Did the advance shipment and received the replacement unit and shipped back the defective unit. Checked my credit card statement and Microsoft charged me $1058. I contacted them to dispute the charge and rep stated that the screen of the defective surface was shattered when they received it. I explained that it wasn't shattered when I gave it to FedEx. Then they asked if I took pictures of the screen before shipping. Just so happens that the tech I spoke with before shipping asked me to email him pics of the screen. They located the pics and told me my issue would be escalated. I received an email from the escalation team that said there was a "scratch" on the case and I would be charged. I asked for more details on this mysterious "scratch" because at first I was told that it was a shattered screen. Then they respond with a terms of service email and still no explanation on the "scratch". Basically stating that I will be charged and there is nothing I can do about it. Microsoft completely robbed me. Nothing they have stated is true. Beware. Billion dollar company stealing money from consumers. 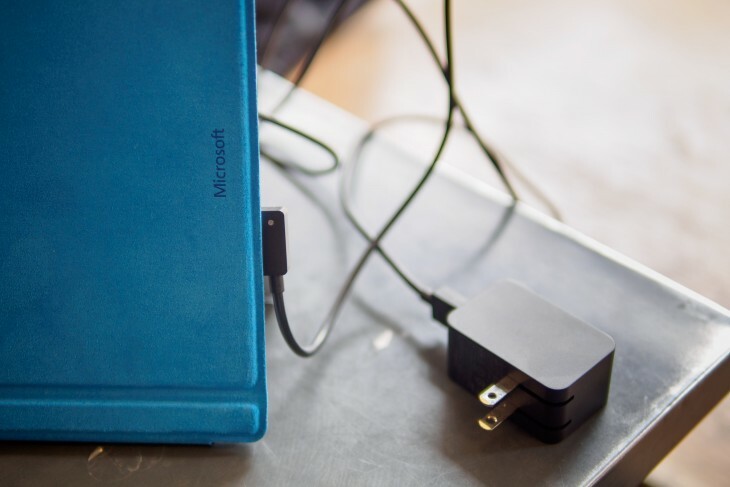 I have had my surface 3 for hardly a year and it has not been charging correctly. I have taken good care of it yet I'm having problems even being able to charge it. The charger has to be in the perfect spot for it to maybe charge. I'm in graduate school with all my notes for my test on here and it could possibly make me fail a test because of your poor product. This is unacceptable and I want a solution because it is very frustrating when I need to study but know I can't because I'm just praying my surface will charge. I am here to share with you a very bad experience with the Surface Book and the service support I received for the last 4 weeks. I bought a Surface Book In December 2015 and the display suddenly stopped functioning without any image in May 2016, while I was traveling. I had to get an external monitor to work with the computer for more than a month. When I returned home, I called Microsoft Surface Support. The person attended my call was very sympathetic about my miserable time with the computer. Initially, he offered an advanced exchange and tried to set up a payment method online but not successful because the website cannot change the country from United States to Canada. So, we did a standard exchange on June 11 with UPS Expedited service. After I received the shipping label, I sent the nonfunctional computer with the power supply and the pen (I now realized sending these accessories was a mistake on my side), and I received the replacement in no time (June 16, 2016). But, I was totally surprised that the power supply and the pen are not included in the package. So I called the support again and again. For the last four weeks, I have received the same answer that they will get back to me with the accessories. In the end, can you imagine what I received yesterday in the email? I was told that the accessories were not in the package I sent. What a big liar! I purchased my Surface Book last November 29, 2015, Serial # 008984654357 from Best Buy. This week I spilled coffee on the keyboard. Upon calling Technical Support to see how I might get it repaired or replace the keyboard, I was told that the keyboard can not be replaced nor repaired and that there was no way to get the computer up and running. I can not charge it without the keyboard, so therefore it is just a $2100 paperweight. I have been a faithful Microsoft user for 30 years and never have I encountered a situation where it can not be repaired or replaced. I also was told this problem exists with all the Surface products. I will never purchase a Surface product until this is corrected. I can not believe you released a line of products which can not be repaired or replaced. I accept responsibility for the coffee, but am so disappointed in Microsoft. To try and fix this I copied the doc from my external onto the surface in documents folder. further more, if i had to leave the doc I saved and closed it. When i when i went back to it the doc was as it was when I closed it. However, when it came time to close out I cut and pasted the doc from the surface and put it in it's original place on the external drive. Guess what? Nothing had been saved. All of the work that I had done on the surface was gone and I was back to where it was before I put it on the surface pro. None of this happened before with 10. I'd really love for someone to help me figure this out because I'm seriously upset. The touch firmware for the Windows 8.1 Surface tablets corrupts after certain updates are applied; especially on the Surface 2. Judging by the vast amount of complaints, (Google reports over 600k hits about this issue for all Surface platforms), this has to be a known problem. I called MS support and spent 4 hours on the phone with them. They had me reinstall Windows entirely and go through all the updates--NO GOOD. I have followed this procedure three more times since--still--NO GOOD! What is more, in spite of the THOUSANDS of online forum postings on trouble shooting boards about this issue, Microsoft support personnel act as if they are unaware that there has been any problem with the Surface touch firmware and hardware. In other words, Microsoft customer service trying very very hard to cover up the problem! Moreover, since it typically happens to the vast majority of people just after their warranties expire, (and just after updates), one cannot help but wonder whether this is some strategy to PRICE GOUGE customers in to buying upgraded models. I say this because after to going through useless exercises to repair the problem, the tech tried to hit me up to buy a newer model!! My response: why would I buy a tablet from a company who cannot build a tablet that ensures the most primary function of the tablet, (the touch function), is reliable? Who in there right mind would buy a second piece of crap? Sorry Microsoft, but next tablet I purchase will be an iPAD. Well I purchased a Microsoft Windows Store card that says its good for Windows, Windows Phone, and select Xbox stores. I loaded it and then went to my apps store on my RT surface tablet and it wouldn't work. So after two hours online and three different support agents I'm told that my card is only good for x- box, which I don't have, so I'm out $25.00. I am not happy and my next purchase will be a iPad. Since 17th July 2015 I have been trying to obtain from you a replacement 'Arc Touch Mouse Surface Edition'. I have produced evidence of purchase and Microsoft have agreed to replace it but that is where is all seems to stop. The problem seems to be that because I purchased the mouse in USA but live in UK Microsoft seem to be unable to agree who will provide the replacement. I am invoking my rights under the warranty and as stated Microsoft have agreed to replace it. I have already spent hours on the telephone both to USA and UK and the replacement of this mouse is now becoming a matter of principle. I have had the following case Nos. SRX12954673861D; SRX1300732281D; 1300732208. No help from MSFT customer support so far, let's see if this helps get their attention! I purchased a Surface Pro3 and keyboard cover and Windows 365 in late April. Within a few weeks I noticed it was overheating to the point I could not touch it and making a very loud noise like rain or distortion. This was audible to people on skype calls. By this stage also the space bar did not work on the keyboard cover. On 17 June I initiated a Service Request to have both exchanged. On the day after I initiated this request the hinge on the backstand also broke and I cannot close the backstand now. I sent an email to the Service Centre advising of this. After not hearing for days I emailed back and then heard back from the exchange centre here in Singapore saying that I could go there on Saturday. When I went to pick up the exchange they would not take the tablet as they said I had damaged it, to which I responded that it was defective, not damaged. They answered that they would need approval to exchange this and would do that the following Monday and have it couriered to my office. I did not hear anything for a week and by this stage also realized that the WIFI problems I were having were due to the tablet, not my WIFI as I did not have those same problems when I went back to using my Sony laptop. By this stage I had no confidence in the product and did not want to exchange it then have it break down again when out of warranty. When they emailed me back I instead asked for a refund. They said they did not have that process and did not have authority to do that. I asked them to pass me on to someone who did have authority. I have spent the last 4 weeks constantly following up with emails that no-one answers. Three times now someone from the service centre in the Philippines has called me or emailed, and in the phone calls they have promised to escalate this to their supervisor and resolve it, but then no-one calls me back. They have not responded to my last three emails sent back to their generic email address. There is no email address for Microsoft USA that I can send a complaint. I called back a number on my phone call log that they had called me from and the person there said she was Sales and could not help me and that I should go back to the website for Surface service and initiate contact. This is going round in circles, no one will reply to me or fix the problem and no one will give me the email address or phone number where I can lay a complaint. Purchased the Microsoft Band which became faulty. Did an advanced exchange which replaced my band with a second hand one which also had the same fault. The Support engineer Anthony in Surface care team was useless in dealing with my issues and gave no answers to my concerns. I am angry that I have been given second hand equipment when I paid full price for new equipment. Absolutely disgusting! Surface Pro 3 is totally useless as you can't use a cd drive or a hand scanner. There isn't enough power and can't add any external hubs or anything to produce the extra power. I got rid of my computer so I can't get my pics/songs that are on cd onto the surface pro 3. Sales people were no help either. Told it would take the place of my computer but it's nothing more than a tablet which I already have. Any suggestions? I returned a SurfacePro3 (SN 043219242653) i7 256GB 8mb RAM as the screen was cracked for repair/replacement, yesterday I received back the replacement (SN 009955743153) which is an i5 128GB 4mb RAM which was also set to a foreign language. I have contacted the surface customer support techs this morning case ref 1284251947 and they tell me this will be escalated for review which will likely take 3-4 business days, I will then be sent a shipping label to return the wrong one and then once received they will then send me the correct spec so I will be without the correct spec machine for at least another week. I find this unacceptable as the current situation is entirely Microsoft’s fault but you wish to inconvenience me further. Does anyone else want to file a class action lawsuit against Microsoft for their continual lack of services. I feel I have a lawsuit all by myself since the product that was purchased for me Surface Pro almonst burned my leg and when it was this hot it cracked the screen and Microsoft will not take responsibility for it. They have lead me on since 2/7/15 with we will help you until today now they say they can't help me. This production cast $900 out of my familys pocket for a christmas gift and I have not been able to use it. I have several claim ticket numbers I just want someone else join in with me. Have feedback for Microsoft Surface?